University of Texas Press, Austin. Contents, preface, appendix, notes, bibliography, index, 1 map, 1 table, 39 black and white photos, 8 color plates, xii+296 pp. hardcover, $65. There are 86 years to go, but this book has already established its place as the best historical work on the Americas in the twenty-first century. Following an engaging Preface in which Schwaller describes his discovery of this most important document in Sevilla, in 1977, and his subsequent and protracted collaboration with Nader, the book is divided into eight brilliant chapters. The first is an introduction and the second a synopsis of the conquest. Individually and together these two chapters provide an insightful beginning to the book, and indeed an eloquent entry to the subject matter for those new to the field. Chapter 3 places the petition in its historiographical context. It points out consistencies and inconsistencies in the works of López de Gómara, Días del Castillo, Tapia, de las Casa, Cervantes de Salazar, and more recent writers. The fourth chapter is a brief description of the petition, arguing that the 318 signers shared something in common with the signers of the Declaration of Independence—they ran the risk of being charged with treason. Chapter 5 is beautiful. It consists of individual folios and a translation. Each left-hand page contains a photograph of one side (recto or verso) of the document and the facing right hand page is a printed transcription. The chapter ends with an English version of all folios other than those with the signatures. Chapter 6 discusses the signers, their identities, places of origin, and occupations. 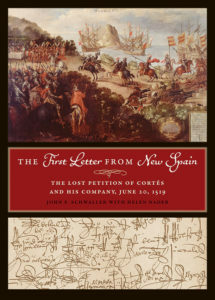 It also explains why a few hundred people did not sign, including Cortés himself as well as women. Chapter 7 consists of brief biographies of the signatories. It puts a decidedly human face on historical events. Conclusions comprise Chapter 8. The appendix is a list of 545 signers of the 1520 Segura de la Frontera Letter.